I've had it for a couple of years now, but it could still use some work. My skin just wouldn't take the gray very well. Edit: It's on my left ankle. I'm planning to get something similar to that on my side someday. 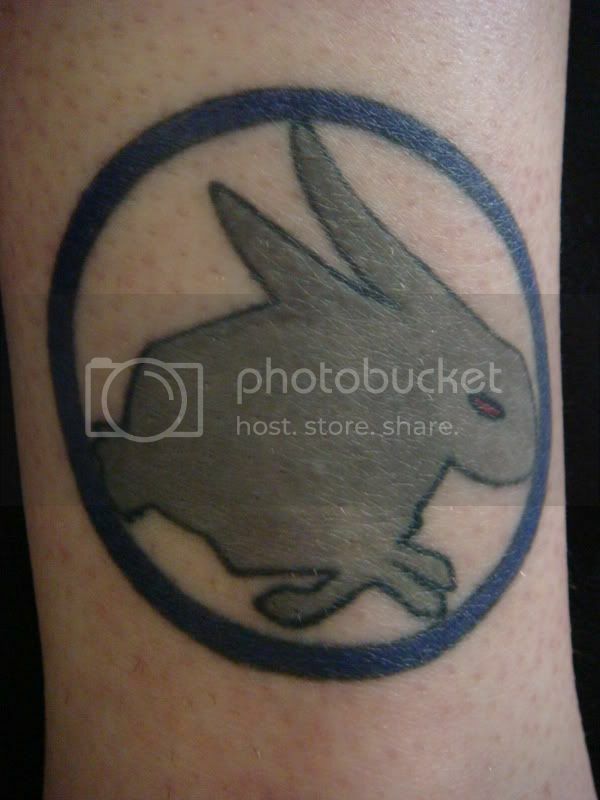 im getting the bunny logo too i just cant decide where. my friend mike and myself are getting it done together. and i didnt think of getting it on my lower back thats a cute spot. 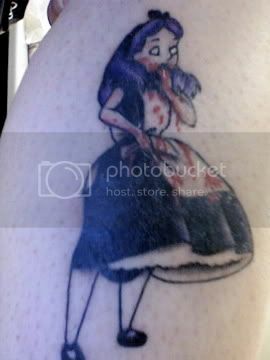 i have the bunny logo on my hip id post a pic but i have to wait.., i got it done 2 1/2 years ago and the guy fucked it up baaaaadddddddd its all splotchy. i havent had a chance to get it fixed but as soon as i do ill post it. i was considering getting the bunny silhouette as a chest piece and i'm a girl. i only want the rabbit though, with the pink drippings from the mouth, not the circle and background though. but yeah. i loooove the alice one. i have a keyhole tattooed on the back of my neck and when people see it i get alice in wonderland remarks a lot. haha. thanks i just adore it, im going to continue to go the same guy from now on. *El comentario anterior pudo (y contuvo) una alta dosis de sarcamo, sátira, ironía e insanidad. I must agree that is a very poor likeness. I feel bad saying that, as I know how permanent a tattoo is and how personal they are to people. but I plan to be a licensed Tattooist in the next few years. and work like that makes me cringe. I would never have had that artist do ANYTHING on me. if you can't keep a line from fuzzing, and you can't change needles between every color. you don't really need to be doing work that requires as much skill as Portraiture. Apologies in advance, each to their own but what was the point?